William Henry Yates (1845-1934) lived in Union Springs, NY and was an important art teacher and professional artist in this historic and scenic village in western Cayuga County on the northeast shore of Cayuga Lake. 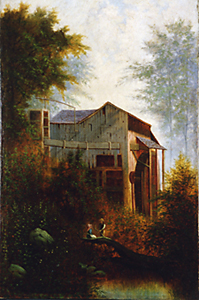 He often painted views of the lake from the village, including lake views of Frontenac Island. He made many excursions painting along the canals at the north end of Cayuga Lake. 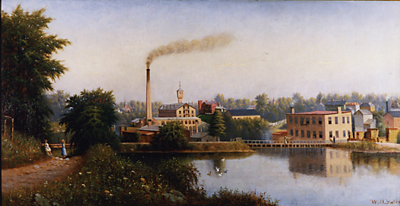 The Cayuga Museum owns an interesting cityscape of Auburn, showing the Owasco Outlet and mills. More of his work is visible in the Frontenac Historical Society in Union Springs. “William Henry Yates Magulipin was born in Schenectady, NY August 16, 1845. 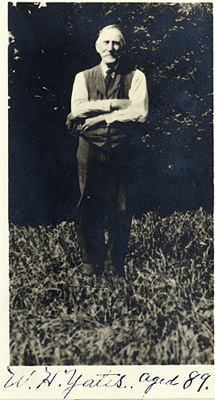 Most of his paintings are signed “W.H.Yates” as he was usually known by this name. He came to Auburn, NY as young man of seventeen and enlisted in the infantry during the Civil War, serving out the entire war and seeing action in about twelve battles. It has been assumed that during the war period, Yates knew one of the commanders, Kennedy, who was a fine painter. It is assumed that the may have studied or worked with either Charles Loring Elliott or Sanford Thayer or both. Bill Hecht has done extensive research on the history of Cayuga County and Union Springs and posted much of it on the web, including a page of W.H.Yates’ sketches.